Today, we exchange the instruments of ratification for a treaty that lessens the nuclear dangers facing the Russian and American people and the world. Two years ago, we all laughed about the translation of the ceremonial “Reset Button” that I gave the Foreign Minister in Geneva, but when it came to the translation that mattered most, our two countries, led by our two presidents, turned words into action to reach a milestone in our strategic partnership. And when it comes to the button that has worried us the most over the years — the one that would unleash nuclear destruction –today, we take another step to ensure it will never be pushed. Our countries will immediately begin notifying each other of changes in our strategic forces. Within 45 days, we will exchange full data on our weapons and facilities, and 60 days from now we can resume the inspections that allow each side to trust but verify. Additional information on START is available. See links below. Congrats Madame Secretary! Wob well done, and I hope people (besides us) will give you most of the credit for this one day. LOL…Like from advert for shampoo! 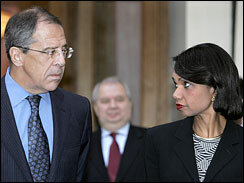 Foreign Minister Lavrov is supposedly a rather prickly individual, but Secretary Clinton seems to get through to him. He’s laughs and smiles when he’s with her. It a real improvement over this, don’t you think? Big improvement. I have been saying that for two years. She managed to charm him!